This piece was previously published at the Huffington Post. The crisis of humanity we see in the Mediterranean and Europe is part of a much larger complex of issues related to how the international community deals with war, atrocities and humanitarian crises. The situation where hundreds of thousands of refugees which have come knocking at Europe’s doors is the logical consequence of an international system which has developed many mechanisms to cope with the human rights and humanitarian fallout of war but which does not follow through in implementation. The international community has developed and recognised three core types of responses and international responsibilities for conflict and associated humanitarian crises, namely military responses, judicial responses, and humanitarian responses – what I call the responsibility to protect, prosecute and palliate. The responsibility to protect (R2P) says that states have the primary responsibility to protect their own people from genocide, crimes against humanity, and war crimes. But if they fail – or are responsible for such crimes themselves – the international community must step in to protect people. This doctrine was first formulated by the International Commission on Intervention and State Sovereignty in 2001, and was formally recognised by the UN at the 2005 World Summit. It is directly connected to a broader conceptual shift in the relationship between sovereignty and human rights. R2P includes many different types of activities, but the most important and game-changing aspect of the World Summit declaration was that the international community was prepared to use military force to protect people from being slaughtered. It has been invoked in UN Security Council resolutions more than 25 times since 2006. The responsibility to prosecute involves the idea that states and the international community generally have a responsibility to prevent impunity for mass atrocities. Those most responsible for such crimes must be punished. While this idea has found expression in a number of ways, the most important development has been the permanent international institutionalisation of the responsibility to prosecute in the International Criminal Court which can prosecute individuals for mass atrocities. The provision of food, water, shelter, and medical assistance to those caught up in conflict is the third type of response used in all armed conflicts and associated humanitarian crises. I call it the responsibility to palliate because, like palliative health care which is focused on treating symptoms and keeping people comfortable rather than curing disease, humanitarianism is focused on keeping people alive on a day to day basis rather than addressing the underlying causes of the conflict and displacement. Why is this important for the refugee crisis today in Syria, Europe and elsewhere? The conflict in Syria is political and military in nature, but the response has been primarily humanitarian. Russia and China have blocked invocation and application of R2P in Syria. Yet, countries such as the US and UK, which have contemplated unilateral military action to protect civilians, have also decided in the end that it is not in their interest to do so. The international community has failed in its responsibility to protect civilians in Syria. Russia and China have also prevented a referral of the situation in Syria to the International Criminal Court. Such a referral, which UN Secretary-General Ban Ki-moon has just called for, while not immediately leading to a resolution of the conflict, would put additional pressure on President Assad and other parties to the conflict to stop targeting civilians. And it might induce some senior commanders to defect to avoid ending up in The Hague. More generally, it would signal that the world is serious about stopping impunity for gross violations of human rights. The international community has failed in its responsibility to prosecute and hold people accountable for atrocities in Syria. Where the international community has failed a little bit less is in the humanitarian response. Yet, even this slightly lesser failure creates its own problems. Because the conflict is frequently framed in humanitarian terms, other considerations – such as actually protecting people from direct violence – are lost in the magnitude of the humanitarian crisis. It is easy to be numbed to the reality of the situation when statistics are cited – 4.1 million people have fled the country. 7.6 million have been internally displaced, and a total of 12.2 million are in need of assistance. At the same time, while just under $1 billion has been provide for the UN’s Strategic Response Plan for Syria, it is still $1.9 billion short. The focus becomes the amount of money spent, the amount of food provided, and the urgency of getting access to populations, rather than actually protecting people. The failure has been compounded by the response in Europe. EU leaders have recently pledged €1 billion in additional humanitarian assistance to help those in the region. While welcome, it still falls short of the need and, more importantly serves to avoid dealing with the humanitarian crisis on its shores. More than 520,000 people have landed on the shores of Europe in 2015 after crossing, at great peril, the Mediterranean, with more crossing over land. 55% of these are from Syria. What has been the response? While Germany initially said that it would welcome up to 500,000 asylum seekers a year, it has backtracked. More generally, many countries have denied that this is a refugee crisis – instead arguing that most are just ‘migrants’ who are looking for better economic opportunities. They have also closed borders, put up fences or attempted to shift the burden to other countries (including those in the region like Lebanon and Jordan, which have born the brunt of the crisis and where refugees now account for 1 in 4 and 1 in 3 of their populations). While many European countries have agreed to resettle a total of 120,000 refugees, other countries, such as the UK, have opted out. The UK, instead, wants to cherry pick a small number of the most suitable refugees to resettle directly from the region. And the 120,000 hardly responds to the scope of the crisis – a crisis which has no end in sight. In Syria, the crisis is frequently put in humanitarian terms and the response has been humanitarian. Internationally-recognised responsibilities to protect people at risk of atrocities and to punish those who commit atrocities have been ignored. Palliation substitutes for protection. In Europe, there are attempts to remove even the humanitarian framing – identifying hundreds of thousands of people as migrants who simply want to come to take our jobs, rather than as those who are in desperate need of protection and other assistance. This is a dramatic failure of responsibility at all levels of political leadership. 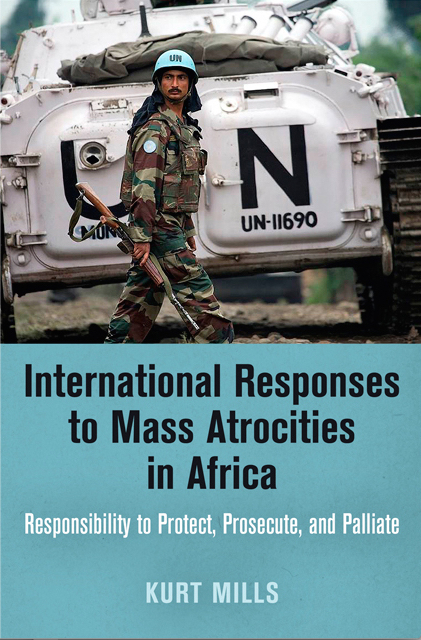 I am pleased to announce the publication of my new book International Reponses to Mass Atrocities in Africa: Responsibility to Protect, Prosecute and Palliate by the University of Pennsylvania Press as part of its Pennsylvania Studies in Human Rights series. Since the end of World War II and the founding of the United Nations, genocide, crimes against humanity and other war crimes—mass atrocities—have been explicitly illegal. When such crimes are committed, the international community has an obligation to respond: the human rights of the victims outweigh the sovereignty claims of states that engage in or allow such human rights violations. This obligation has come to be known as the responsibility to protect. Yet, parallel to this responsibility, two other related responsibilities have developed: to prosecute those responsible for the crimes, and to provide humanitarian relief to the victims—what the author calls the responsibility to palliate. Even though this rhetoric of protecting those in need is well used by the international community, its application in practice has been erratic at best. In International Responses to Mass Atrocities in Africa, I develop a typology of responses to mass atrocities, investigate the limitations of these responses, and call for such responses to be implemented in a more timely and thoughtful manner. I consider four cases of international responses to mass atrocities—in Rwanda, the Democratic Republic of the Congo, Uganda, and Darfur—putting the cases into historical context and analyzing them according to the typology, showing how the responses interact. Although all are intended to address human suffering, they are very different types of actions and accomplish different things, over different timescales, on different orders of magnitude, and by very different types of actors. But the critical question is whether they accomplish their objectives in a mutually supportive way—and what the trade-offs in using one or more of these responses may be. By expanding the understanding of international responsibilities, I provide critical analysis of the possibilities for the international community to respond to humanitarian crises. This post originally appeared on the End of life studies blog, and was adapted from my new book International Responses to Mass Atrocities in Africa: Responsibility to Protect, Prosecute and Palliate (University of Pennsylvania Press, September 2015). In the context of armed conflict, humanitarianism frequently functions as palliation. It is a powerful tool which must be used cautiously, with a close eye on political agendas. Palliation as a concept is most often used in the context of end of life medical care. There is a recognition that medical care can longer cure a disease or life-threatening illness, and so medical care is, instead, reoriented towards making the patient as comfortable as possible for the time they have left. However, this idea can be applied, both positively and negative, in a number of other areas. One area where it might be applied critically is in the conceptualisation and practice of humanitarianism – the provision of food, water, shelter and medical care to those caught in the midst of war. There are many approaches to humanitarianism which revolve around whether or not humanitarians see themselves as political, and whether or not they accepts constraints on what they can accomplish – i.e. attempting to protect human rights by reporting on the abuses they witness and hoping for greater international response. Yet, such witnessing (or temoignage as Médecins sans Frontièrs conceptualises its work) can create significant problems for humanitarian organisations, underming their claims to neutrality and impartiality upon which they depend to gain access to affected populations. Further, any claims to protection are tenuous, as humanitarians cannot usually directly protect people from armed groups, and any attempts to induce greater international protection – in particular in the form of an armed military intervention to protect people – are far from certain. Thus, in its most basic sense, humanitarianism is palliation. Palliative care is an approach that improves the quality of life of patients and their families facing the problems associated with life-threatening illness, through the prevention and relief of suffering by means of early identification and impeccable assessment and treatment of pain and other problems, physical, psychosocial and spiritual. In the medical sense, palliative care ‘intends neither to hasten or prolong death.’ It ‘provides relief from pain and other distressing symptoms’ and ‘offers a support system to help patients live as actively as possible until death.’ The ‘illness,’ the symptoms of which humanitarians treat, is not the malnutrition and diseases from which those affected suffer. Rather, it is war and violent conflict itself. Thus, whereas palliative care ‘affirms life and regards dying as a normal process,’ humanitarianism as palliation affirms life but also regards war as a normal process. It takes the world and its illness – war – as it is and helps those affected by the illness – refugees, internally displaced persons, and others – to stay alive – hopefully until the war ends and localised illness is cured, or until the illness – war – ultimately kills them. It treats the symptoms rather than effecting a cure. While many millions of people have been saved by humanitarianism, it must seem for some caught in the midst of conflict that the refugee camp is akin to a hospice, with humanitarians keeping refugees alive and comfortable until the war – either directly through an attack by armed forces or indirectly through malnutrition and war-associated disease – kills them. This description is in no way meant to devalue the work of humanitarians. Indeed, most people helped by humanitarians live to see the end of the war in which they are caught, and even those in hospices will appreciate the efforts undertaken to ease their pain and make them comfortable as the inevitable happens. Yet, taking war as inevitable imposes rather severe limits on the goals of humanitarians. At the same time, some humanitarians do not take the inevitable as such, and attempt to go beyond palliation. Indeed, humanitarianism as palliation engages with many different interests and perspectives. The International Committee of the Red Cross may see palliation as the ultimate expression of humanity – you are keeping people alive for this one day, and hopefully the next, and the one after that, and so on. And many other international humanitarian organisations also see this as their humane goal, while others want to go beyond palliation and find a cure – that is, address the root causes which are leading to the disease of war which is killing so many people. This creates operational problems. It also brings them into conflict with others who may prefer palliation as state policy. That is, while states – especially rich, Western states with the resources to put toward stopping conflict – may want to see a particular conflict stop and prevent people from being killed – they do not necessarily want to invest the resources (troops) to do so. Palliation thus becomes the preferred course of action, and a substitute for more robust action. Thus, to bring the medical analogy to a close, instead of bringing in surgeons (troops) to excise the tumor of war and genocide, states bring in hospice workers (humanitarians) to keep people alive until the war ultimately kills them. This recourse to what de Waal (1997) calls the humanitarian international, or what I have described as the Land Cruiser Brigade (Mills 2006), appears to give humanitarian organisations significant power in the midst of conflict. Yet, it also brings with it many problems as humanitarians become politicised, wedded to one side in a conflict, and perceived, according to Hardt and Negri (2000), as the ‘mendicant orders of Empire,’ ‘some of the most power pacific weapons of the new world order.’ The white Toyota Land Cruisers of the humanitarians become a representation of the international community’s response to conflict – more evocative than the armored tank – taking humanitarians into a realm of high politics which conflicts with their depoliticised humane palliation. As a result of the changing nature of conflict, humanitarianism has become embedded within contemporary conflict. Although it may have different interpretations and meanings, it is recognised and accepted as a good thing, an expression of our ultimate humanity. It is, in fact, recognised as a duty or responsibility of the international community. This makes it a very powerful tool, not only for humanitarians themselves but for other actors who may want to use it for purposes other than what its supporters and practitioners may wish. And it is this possibility that should serve as a caution to to those who believe they can engage in palliation – in the humanitarian sense – in isolation from other political agendas. de Waal, Alex (1997) Famine Crimes: Politics and the Disaster Relief Industry in Africa (Woodbridge: James Currey). Hardt, Michael and Negri, Antonio, Empire (Cambridge: Harvard University Press). Mills, Kurt (2006) “The Postmodern Tank of the Humanitarian International,” Peace Review 18:261-267. South Africa and Omar al Bashir: Death Knell of Global Justice or Ambiguous Reaffirmation of the Responsibility to Prosecute? A slightly different version of this post can be found here. A remarkable scene played out in South Africa on 14 and 15 June. Over the course of two days global and regional geopolitics were pitted against international justice norms as a wanted war criminal – President Omar al Bashir of Sudan – defiantly came to the country to attend an African Union summit and stealthily fled ignominiously in fear of being arrested. The UN Security Council referred the case of Darfur, where his government has been accused of committing and supporting war crimes, crimes against humanity, and genocide, to the International Criminal Court in 2005. An arrest warrant was issued by the ICC in 2009. While African countries were some of the strongest supporters of the ICC from the beginning, and there are 34 African states which are members of the court, the case against Bashir has played out against the backdrop of accusations of bias on the part of the ICC against Africa and charges of neo-colonialism. The African Union has asked (to no avail) the Security Council to suspend the case against Bashir (as well as against the President and Deputy President of Kenya) and called on African states not to cooperate with the ICC. Some African leaders have called for a mass withdrawal from the Rome Statute of the International Criminal Court. First, there has been a sea-change globally with regard to the relationship between human rights and state sovereignty; it has been recognised that States cannot do whatever they want to their people and that sovereignty entails responsibilities toward citizens. The AU Constitutive Act has specifically recognised the right of the AU to intervene when states commit mass atrocities against their people. Yet, many leaders are having a hard time accepting that they and their colleagues in other countries are not immune to charges of mass atrocities. Second, (many) African states are torn between supporting human rights and pan-African solidarity. When faced with supporting global human rights norms or showing support for a fellow African leader, two aspects of contemporary African politics come into conflict. In the current situation, South Africa, even though it has repeatedly stated that it would arrest Bashir, appears to have chosen African solidarity over its global human rights obligations. On 14 June the South Gauteng High Court, in response to an application by the South African Litigation Centre, ordered the government to temporarily prevent Bashir from leaving South Africa until a full hearing could be held on the request to arrest Bashir and send him to The Hague. On 15 June, the court held a brief hearing and then adjourned for an hour at the request of government lawyers who argued they needed more time to review documents. Minutes later, Bashir was allowed to leave on his plane, which had been moved from a civilian airport to a military base. Subsequently the court, before being informed of Bashir’s departure, called the government’s actions unconstitutional and ordered the government to arrest Bashir. What are the implications of what appears to be a blatant disregard for the rule of law and international legal obligations? First, the fact that Bashir was forced to surreptitiously leave the AU summit early demonstrates that the ICC does, in fact, have an effect. Bashir has been delegitimised and is on the run like a common criminal. He had twice previously refrained from coming to South Africa because of fear of arrest. This time it appears that he decided to try to test the ideational power of the ICC. The South African Government tried to endow Bashir – and all others leaders attending the AU summit – with immunity. It argued that this is based on general principles of international law, but an exception to head of state immunity has developed in cases of the commission of international crimes. Further, the Rome Statute clearly indicates that nobody is immune to prosecution. Although Sudan is not party to the Rome Statute, the Security Council referral gave the ICC jurisdiction and removed Bashir’s immunity in this situation. Second, and paradoxically, it demonstrates the weakness of the ICC. The ICC relies on states to enforce its decisions. All members of the ICC are required to comply with arrest orders, and in the case of Security Council referrals, all states, regardless of whether or not they have ratified the Rome Statute, are obligated to cooperate with ICC arrest warrants. Several other governments have ignored these obligations. In some ways, the refusal of South Africa to comply with the court’s order is particularly worrying. Given its history of apartheid, it was expected to be particularly supportive of, and sensitive to, human rights. For the South African government to now ignore both its own courts and its obligations under international law by allowing Bashir to leave the country, is shocking and distressing. In the context of other actions taken by African States Parties in defiance of their obligations under the Rome Statute this further raises significant questions about state commitment to the ICC. The ruling African National congress asserted that the ‘ICC is no longer useful for the purposes for which it was intended.’ And, in the court hearing, a judge raised the question of whether South Africa, by defying the ICC, would be obliged to withdraw from the Rome Statute. Such an eventuality would indeed be damaging to the ICC. Yet, and third, even though there have been attempts over the past few years to get the AU to call for mass withdrawal, this has not happened. This is just one of a number of a number of situations where the ICC has faced such challenges. But the fact that his plane had to move airports and he had to leave surreptitiously raises serious questions about his actual freedom of movement – as does the fact that the South African government had to go through so many machinations to allow him to leave, including asserting, as a government lawyer did during the court hearing, that he might be shopping rather than in the process of leaving the country. When governments are required to come up with such fanciful and absurd cover stories, this is evidence that they know they are doing something wrong and shameful. And such shame is partly what drives compliance with human rights norms. Bashir’s freedom of movement is far from complete. In 2013, Bashir was forced to cancel a planned visit to New York to address the UN General Assembly. That visit would have been a direct challenge to the ICC and would have made the US very uncomfortable. In South Africa, Bashir’s challenge to the ICC has been only minimally successful, given that he had to sneak out of the country. Fourth, and most fundamentally, such moments of drama and apparent setbacks are to be expected. The norm against impunity and the responsibility to prosecute are relatively new. New international norms, especially those which conflict with other fundamental international principles and state identities, do not appear in the world fully formed and implemented. There will likely be many years before the norm against impunity is enforced in as robust a manner as one might wish. The arrest of Bashir today would have been a major turning point in the fight against impunity. Yet, the fact that the South Africa court ordered the government to arrest Bashir is, in itself, a significant moment. He had to flee in the face of an expected court order to arrest him and cannot come to South Africa again without facing arrest. And there have been other examples of former heads of state being held accountable through various international mechanisms – Charles Taylor, Laurent Gbagbo, Hissène Habré, Slobodan Milosevic. Other investigations are ongoing. Each and every one of these cases is significant, and South Africa’s actions today do not take away from their significance. South Africa’s actions today were disappointing but not entirely unexpected in the broader context of norm development, implementation and contestation. The ICC will live to fight another day, and Bashir’s freedom of movement has decreased just a little bit more. African solidarity won out today over anti-impunity, but it was a pyrrhic victory. South Africa lost a little bit of its international standing, while its courts have upheld the rule of law and the responsibility to prosecute. The former is unfortunate, while the latter is one more link in the chain of international justice. An alternate version of this posting can be found here. On 1 April 2015 the Palestinian Authority will join the International Criminal Court. This could have significant repercussions for the efforts by the Palestinians to gain their own state and on the moribund Israeli-Palestinian peace process. This article will look at how we have gotten here and the possible implications for peace in the Middle East. Palestinian accession to the Rome Statute of the International Criminal Court has been a long time coming. In 2009, the Palestinian Authority requested that the ICC investigate Israel for its actions during Israel’s Operation Cast Lead in Gaza in late 2008 and early 2009. This request was rejected because Palestine was not deemed to be a state and thus ineligible to join or otherwise accept the jurisdiction of the ICC. This situation changed in 2012 when the UN General Assembly accorded Palestine the status of non-member observer state (after a failed application for full membership in 2011). After 2012, the Palestinians joined a number of international organisations, such as UNESCO, and periodically indicated that they would join the ICC and refer Israel to the ICC. It failed to do so for two years, partly because of pressure from the US, the UK and France, and partly because using the threat suited Palestinian political interests. While the question of Palestinian statehood is still controversial, it status has been accepted such that it has been able to join the ICC. Since the ICC can only investigate potential war crimes, crimes against humanity and genocide committed on the territory of a state party, or if the UN Security Council refers a case to the ICC, Israel’s occupation of the West Bank and Gaza, and other military activities against Palestine have been beyond the Court’s reach, as have the actions of Palestinian groups, in particular Hamas. Israel, like the US, is a signatory to, but has not ratified, the Rome Statute. Palestinian accession to the Rome Statute changes this dynamic, as does Palestine’s acceptance of ICC jurisdiction since 13 June 2014. On 16 January, the ICC Prosecutor, Fatou Bensouda, opened a preliminary investigation on the situation in Palestine. The transfer of Israeli citizens into the Occupied Palestinian Territory, prohibited under international humanitarian law and international criminal law, is a central feature of the practices and policies of Israel. The bigger issue would be identifying those most responsible for this policy (and other actions taken against Palestinians). This could very well be include Prime Minister Netanyahu and his predecessors, as well as other senior government officials and military commanders. The ICC operates on the principle of complementarity, so it would have to be satisfied that potential crimes have not been investigated by a competent authority. The Palestinian Authority cannot investigate and try Israelis, and Israel has obviously not investigated its own citizens for the settlement policy, since it is governmemt policy, and it has undertaken few investigations of its own soldiers for crimes committed in Gaza or the West Bank, so this criteria would most likely be fulfilled. One question would be whether the Prosecutor decided to prosecute members of Hamas for its indiscriminate rocket attacks and other actions. She might, or she might also decided that on the basis of gravity, the actions by Israel were much more serious and extensive, with much wider effect, and thus decide not to prosecute Palestinians. There is precedent for this. In both the Democratic Republic of the Congo and Uganda, Bensouda’s predecessor, Luis Moreno Ocampo, decided not to investigate actions of government soldiers, deeming them not of sufficient gravity. This failure to prosecute government soldiers was an attempt to gain the cooperation of the governments involved, and has been roundly criticised. It would seem unlikely that in this case the Prosecutor would choose not to investigate and prosecute Hamas soldiers. The relationship between Hamas and the Palestinian Authority is different than that between a national military and the government, although it could be argued that the Palestinian Authority still has responsibility for the actions of Hamas. Further, given the intense international scrutiny and political pressure that the Prosecutor will be under from many actors, she will have to be seen as being completely evenhanded. Not prosecuting Palestinians would seriously damage the credibility of the investigation in the eyes of many who would otherwise support the ICC. So, what are the implications of the investigation? They are complex, multi-faceted, and extremly unpredictable. This is particularly the case given the recent Israeli election, during which Prime Minister Netanyahu, who will retain his position, stated that there would be no Palestinian state while he was in power (he has since repudiated this stance, but few believe him). Sanctions against the Palestinians: Israel has already retaliated by refusing to transfer to the Palestinians more than $100 million per month it collects in taxes (it has partially backpedaled on this, but has not necessarily removed the threat of further sanctions). Further, the US Congress has passed a law mandating that all economic assistance to the Palestinian Authority be cut off if it joins the ICC. These two actions could have effect of severely underming the Palestinian Authority’s ability to operate, potentially causing it to collapse. This would severely damage the peace process, but given that the peace process has effectively collapsed anyway, this would just further accelerate future actions. This might mean further radicalisation among Palestinians, further destabilising an unstable situation. And it could entail greater sympathy and support for the Palestinians. Driving the final nails into the coffin of the peace process would either mean continued occupation and war with the Palestinians ad infinitum, or the recognition of a single state encompassing the territories of Israel and Palestine. The latter would mean either a non-democratic Jewish state which institutionalised an apartheid-like system, or a democratic non-Jewish state, where all Palestinians received full citizenship privileges. Neither option is enticing for most Israelis – or, indeed, most Palestinians. Deterrence against both Israel and Palestine: Could Palestinian accession to the Rome Statute and the subsequent investigation serve to deter Israelis or Palestinians? It is unclear. Israel is already on the hook for its actions during Protective Edge and its continuing occupation and settlement policy. It reserves the right to take further military action to protect its security, and it perceives the occupation and settlements as key to its continued existence. Given that these are existential questions for Israel, legal challenges from a weak and ineffective court are not going to get it to change its policies overnight. It may think it can depend upon continued protection from the US, although given the breakdown of that relationship recently, it is unclear the extent to which the US will protect it. The US could attempt to get a resolution through the UN Security Council which suspended the investigation, but that would be open to veto by one of the other permanent members, and there is no guarantee that it would attract the necessary nine votes to pass. Hamas, in particular, is likely not going to be deterred by the threat of the ICC, given, again, the existential nature of the conflict and its demonstrated willingness to endure much more severe punishment (or force Gazans to endure such punishment) from Israel in pursuit of it goals. Revive the peace process: Many, including the US, will not see it as in their interest for the peace process to collapse, so there may be attempts to use this development as leverage to revive the peace process. The Palestinians have previously attempted to get a Security Council resolution calling for an end to the occupation and the creation of a Palestinian state. The US has blocked this. However, it might now decide to support such a resolution in conjunction with a suspension of ICC proceedings, using both a stick and a carrot to pressure Israel to revive the peace process and make concrete progress toward a Palestinian state, support for which the Obama Administration has recently reiterated. It is by no means clear that this would succeed, and would likely engender resistance from both hard-line Israeli politicians as well as many members of Congress. Further, given that a Security Council deferral of ICC proceedings under Article 16 of the Rome Statute would need to be renewed every year, it is possible that Russia, in particular, might decide to invoke a veto at some point. The Israelis could never be entirely sure that even if they did come to a final peace agreement they would not face prosecution in The Hague at some point. Palestinian accession to the Rome Statute has made an extremely complex situation even more complex. It could make the situation even more volatile and unpredictable, or it could bring key parties back to the negotiating table and revive what has long been a moribund and unproductive peace process. For the latter to happen, the Israelis would need to come to a rather fundamental re-evaluation of their interests, which seems unlikely given the recent election. Prime Minsiter Netanyahu and others would also need to think that the ICC posed a real threat to them, which, again, is open to serious question. Israeli leaders have already been able to avoid prosecution under the principle of universal jurisdiction, so may think that the ICC poses little new risk. But even if such calculations were accepted, and ICC prosecution was avoided in the pursuit of a permanent peace settlement, this could have three negative consequences. First, it would undermine the ICC as an institution. If the ICC is perceived as nothing more than a tool to make warring parties come to a peace agreement, it will swiftly lose any legitimacy as an impartial judicial body which help to deliver justice to victims of atrocities around the world, however imperfect that justice may be. Second, those who committed atrocities in Palestine and Israel would stay in power, thus raising the possibility that they could be spoilers as the peace is implemented. Third, those most affected by the conflict would likely be left feeling that they had received no justice. For some Palestinians, finally having their own state might feel like justice, but for others, both Palestinian and Israeli, a lack of retributive justice would inhibit true reconcilliation. One might ask whether this is the best decades of development of human rights norms and mechanisms can deliver. Below are opening comments I made at a Roundtable on Gaza on 25 September 2014, sponsored by the Glasgow Human Rights Network. Tonight, we have with us four experts from Glasgow on the Middle East and/or of international law and international relations to help us understand the recent developments and eruptions in Gaza and Palestine more generally. First, we have Robin Geiss who is Professor of International Law and Security. Second, is Christian Tams, Professor of International Law. Third, is Naomi Head who is a Lecturer in Politics. Finally, we have Keith Hammond who is a Lecturer in the Centre for Open Studies. Before we turn to our panelists, I want to make a couple of opening remarks to set the scene for our discussion this evening. First, this topic is very emotionally laden, and people on all sides of the issue hold very strong views. Everybody is entitled to hold their views, but I ask that the discussion be held in a civil manner befitting Glasgow University, and that everybody is given the chance to speak uninterrupted and that everybody’s views are accorded equal respect – even if you fundamentally disagree. Second, I think it is worth noting that this is the fourth autumn in a row that we have held an even focused on human rights in the Middle East. In 2011, we discussed the astounding events of the Arab Spring. In 2012, we came together with a perhaps somewhat more sober assessment of those events and their aftermath. Last year, we discussed Syria (and recent events have demonstrated we could easily have organised another event with that focus tonight). And tonight we turn our gaze to the most intractable of the many ongoing and interconnected conflicts in the Middle East – the Palestinian/Israeli conflict, and its most recent eruption in Gaza. On the one hand, it is gratifying that so many of you have come out this evening – and to the other events. This indicates a significant level of interest and engagement. On the other hand, the fact that we have to keep returning to this region and these issues indicates that the Arab Spring has a long way to go to live up to it original expectations, and that political leaders and international institutions have not done a very good job of dealing with these conflicts. Third, the title of this roundtable focuses on Gaza, and certainly when this roundtable was first conceived, all the world’s eyes were on Gaza. And the recent events have frequently been portrayed as just the most recent war in Gaza. Yet, this ignores a very fundamental fact – that this particular eruption in violence is tied into a decades-long conflict in Palestine, stretching back to 1948, when the state of Israel was first created, and then to 1967 when the occupation was more formalised as a result of the 1967 war. In the decades since then, there have been periodic attempts at resolving the broader conflict. The dynamics of conflict and occupation have not changed for the better. The occupation remains, and is a daily fact for the people in both Gaza and the West Bank. Yet, the two areas experience the occupation differently. In the West Bank, movement by Palestinians is severely constricted, and there are constant incursions on Palestinian territory, in particular as the Israeli settlements expand. In Gaza, the Israeli military has formally withdrawn, but as we have seen, reserves the right to intervene militarily whenever it chooses. It maintains that Gaza is not occupied, but given that Israel controls most of its land borders, as well as access by sea, and its airport is not functional, it is difficult to describe it as anything else. And since Israel does not recognise a Palestinian state, it is unclear what Gaza would be if it is not occupied territory. Perhaps our international lawyers can shed some light on this. But it uses this portrayal of Gazan self-governance to bolster its claims to self-defense against missiles and mortars emanating from Gaza, while questions of Gazan self-defense against an occupying force are ignored, as are the bigger questions of the Palestinian/Israeli conflict. I think one more statistic is relevant here. Between 2001 and August 29th of this year, 44 people in Israel have died from rocket and mortar attacks from Gaza. That is 2% of the people killed during Operation Protective Edge. And if you take into account two other Israeli operations in 2009 and 2012, it is around 1% of the Palestinians killed, again, the majority of whom were civilian. Further, of these 44, 30 were civilians, including 2 killed at a military post. During the most recent violence, 17 have been killed in Israel, with 12 of those killed at military targets. So, more than 125 Palestinians have been killed for every Israeli killed. Or at least 295 Palestinian civilians killed for every Israeli civilian killed. These figures are in no way meant to justify Hamas sending rockets into civilian areas in Israel. However, they do raise very significant issues of proportionality, which I am sure we will talk about more. With that, I will turn it over to our speakers. See a slightly different version here. I moved to Scotland from the US 10 years ago. Little did I know that I would be helping to decide whether Scotland would secede from the rest of the United Kingdom and become an independent country. I lived in Canada during one of Quebec’s attempts to break away. It failed, as have other attempts, and the independence momentum seems to have slackened, at least for the moment. At the time, I wondered how many attempts a prospective country gets before it is either successful or it throws in the towel. The answer, of course, is that it depends upon the political circumstances. But from a philosophical perspective, the answer is as many times as is deemed necessary by the people. This is because self-determination as a principle and a right is an ongoing process rather than a definitive end point. Further, the end points may be chimerical. On the first point, self-determination can mean many things. For a long time in Scotland it meant having its own legal and educational systems. Then it meant having a parliament which could make some decisions on how its people are governed. If the Scottish National Party (SNP) has its way, self-determination will mean an independent state for the people living in Scotland. If the SNP does not get its way, self-determination will likely mean enhanced tax and spend powers, and maybe a few others things devolved from London. There is also talk of more straightforward federalism. There are degrees of self-determination, and most groupings of people who advocate for this experience something dramatically less than independence. Some might say this is exactly why Scotland should go for it now – this is an opportunity that occurs very rarely. Yet, as we have seen in Canada, this is not necessarily the case. Indeed, while the Yes campaign says this is the only chance Scotland will get, it is quite possible that there would be one or more possibilities in the future if this referendum fails. In 1998 I wrote in a book: ‘For those who aspire to statehood, they may be seeking a prize with decreasing salience as the twin forces of devolution and integration proceed apace.’ I was referring to the new Scottish Parliament and the expanding European Union which provides another layer of identity and sovereignty, and complicates any attempt to situate absolute political authority. Further, given current flows of resources into Scotland from the rest of the UK, as well as the EU, and given constantly evolving immigration and other political regimes, it is difficult to identify sometimes exactly what being an independent country in Europe means. But most fundamentally, as someone who was born in a country which broke away from the UK more than 200 years ago, there are two positions of the SNP which I cannot understand. First, it wants to keep the Queen. The Queen is the representation of sovereignty in the UK and head of state of a number of other countries, such as Australia and Canada, and more generally a representation of political and cultural power. Why would the SNP want this? If I were to advocate for independence, I would want full political independence, without any political figureheads from the former regime. In addition, beyond the question of whether or not it would be good for an independent Scotland to use the Pound, why, as an entity which feels it so important to make such a momentous break from the UK, would it not want to make a clean break? This is the same question with regard to the monarchy. It seems, paradoxically, that Scotland wants to become independent but keep some of the best things about being part of the UK. I also find it a little strange that I, a US citizen and now dual national of the UK, gets to decide on the fate of more than 5 million people (and indeed the fate of more than 60 million given the potential repercussions on the rest of the UK). I understand why this is the case – and why my Scottish in-laws who live in England are not able to vote. But it also highlights how this referendum is different from many other attempts at secession. Most have been based on ethnicity and/or some sense of oppression. This referendum is different. It is based on perceived political differences rather than perceived oppression (although this does seep out every once in a while, and the tone of the Yes campaign has changed significantly in the past couple of weeks). I find this both curious and positive. It is curious because there are equally serious politically cleavages in my country of birth. Indeed, the red state/blue state divide seems to be increasingly apparent. I come from a blue state – Massachusetts – and given what I consider to be the extremely destructive politics which have come out of Texas, I sometimes wish Texas would secede. Yet, I also realize that we are part of something bigger and that I will not always get my own way politically. In the same way, while I am in complete opposition to the policies of the Tories (and was not a particularly big fan of New Labour), I realize that Scotland is part of a bigger political system, and that governments come and go. It is positive in that the divisions are not as fundamental – even if portrayed otherwise – as one frequently finds in these situations. It is also positive because the more social democratic vision provided by the SNP is one that I find appealing – as does the idea of getting rid of Trident from Scottish soil. So, if Scotland does become independent, I would robustly support this vision and would work to keep the SNP true to its word. However, I am also aware that even with a perceived balance of political opinion leaning in one direction, the political decisions do not necessarily end up in that direction. In Massachusetts – which was sometimes derisively referred to as the People’s Republic of Massachusetts (and which was the only state not to vote for Nixon in 1972) – people have voted for series of Republican governors and even a Republican Senator, not always to the best effect. In the same way, even though the SNP argues that Scotland has a different political perspective from the rest of the UK, the reality is probably a bit more complicated, and long-term there will be many political divisions which are papered over by the Yes side. And after the first SNP government, what would we get, given that the SNP’s raison d’etre would have disappeared? What happens when the politics can no longer rely on anti-Thatcherism and anti-Toryism as a touch point? Politics would likely be significantly reconfigured, and the unanswered question is whether, in the end, the politics would be fundamentally different than what we have now. I would hope so, but given so many unanswered questions over key issues of policy, it is hard to know. The Yes side has a compelling vision, but, given the current state of self-determination in Scotland, with more powers promised, and given the fact that there are still too many unanswered questions – Alex Salmond’s assertions on the currency notwithstanding – it is difficult to see exactly what will be gained by breaking up one of the most successful and powerful countries in the world. If the referendum fails this time, I have no doubt there will be another one if people in Scotland really want this. And if some of the scare stories the Yes campaign has put forth actually come to pass – such as privatization of the NHS in Scotland – and if the Tories and UK Independence Party get their way and withdraw from, or very significantly undermine, the European Union and other European institutions, like the European Court of Human Rights, my perspective might well be different and I might be a campaigner for Yes. At the moment, though, the ephemeral nature of national politics makes me question whether secession and independence is really all it is cracked up to be.